Montana is one vast organic solar collector. That solar energy is sequestered mainly by trees, grain, and livestock – which we then enjoy as wood and paper products, fruit, bread and beer, wool, and beef. The Huffington Post said that “The American lawn is now the largest single irrigated crop in the U.S.” But that grass is not wasted in Montana; some 20 billion tons of grass are shipped out of Montana each year in the form of 1 billion pounds of beef. And it is Montana’s ranchers who oversee that conversion of sunlight into high quality protein. 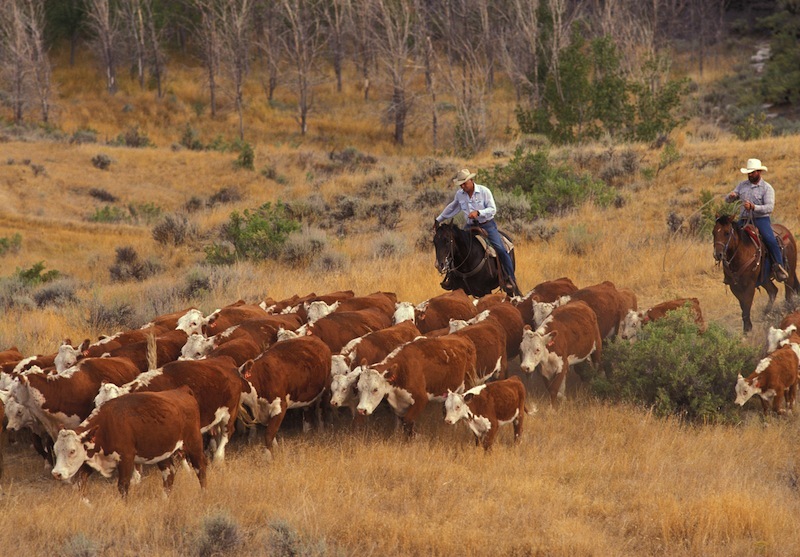 For most folks, ranching isn’t about cows; it’s about a lifestyle. And for me, that lifestyle is about horses. There is no money in raising cows – the profit comes only when you sell the ranch. But who wants to sell the ranch!?! My joy in ranching comes from riding a good horse – one who understands what you want to accomplish and who puts his heart into accomplishing it with you. Horses can only maintain their cow-working skills when they are used, and here on our ranch we still use horses regularly – to cut out heavies, to check the cows, to cut out pairs, to doctor, to bring cattle into the shed or corral, to sort cattle, to brand, to move to new pastures, to fix fence, to check cattle on summer range, and to search for cattle scattered by the wolves and bears. There are plenty of jobs that can still be done faster, cheaper, easier, and better on a horse. But horseback ranches are rapidly becoming a thing of the past. My local barber estimates that fewer than 10% of the ranches in the Livingston area use horses more than a couple of times a year. “I haven’t saddled a horse in two years,” said Pol, a rancher I knew in the Bear Paw Mountains. “First you buy a four-wheeler to do the irrigating, then you figure out how good it will work to run in the horses. “And one day you realize that you could be there and back on the four-wheeler in less time than it would take to get your horse in and saddle it. That’s the beginning of the end. “Then when you really need a horse, he’s so fat and out of tune that you can’t get the job done anyway. I still do my best to maintain that Cowboy tradition. You can read about some of those adventures in my book Ain’t This Romantic!?! – available on Amazon.com.